It's not essential, you'll probably agree, for cocktails to be served in the perfect measures. It's not essential, but it helps. If you don't want to be serving, or drinking, some evil concoction spawned from an unholy mix of randomly-slopped-together spirits, these stainless steel double ended measures are essential for anyone claiming the coveted title of Cocktailer. They give an accurate measure for both 25ml and 50ml shots, and will banish, forever, the throat-stripping sessions that are all too familiar to those unlucky drinkers unable to judge, even remotely, a measure of spirit. These beauties will be a welcome addition to any self-respecting drinker’s den. "Simple stylish design and good price. Delivery charge seemed a bit steep but it was a quick delivery." "Before purchasing this measuring jigger from drinkstuff, my guests would always complain about 'throat burn' and how strong I dosed my beverages. So I decided that if I was going to mix my spirits properly I needed something that I could have control over which is where the jigger is a lifesaver. It comes with 2 measuring ends, 25ml and 50ml and makes it a breeze for mixing drinks, no more just slashing the whiskey all in the glass and hoping for the best, no more asking my guests to take a sip out of their glass to see if they needed more cola or more spirit. I never make an alcoholic beverage without it now. Drinkstuff says: Many thanks for your review Ashley. As a thank you we've added 5 points to your drinkstuff account, which is equivalent to £5 off your next order. "Can you make 30ml jiggers available?" Drinkstuff says: Thank you for your comments Peter. 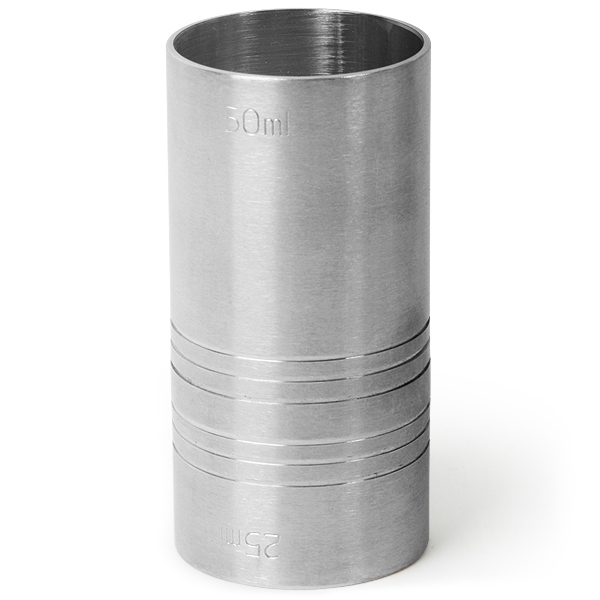 We are constantly expanding our product range, and while we don't currently offer a 30ml measure, we do offer jiggers with multiple measure marks, including 30ml. Please see our full range of Spirit Measures. "Does exactly what you hope it will do. Hope I win the £10 voucher for leaving this review." Drinkstuff says: Many thanks for your review Liam. Unfortunately you haven't received any credits with this review, but keep on trying.